Kidney stone is a common disease of urinary system and results from abnormal metabolism, urinary tract obstruction, infection, foreign body and drug use [1,2]. Its common symptoms include waist abdomen ache, nausea, vomiting, restlessness, abdominal distension and hematuria and so on, seriously affecting the patients’ health and quality of life [2,3]. This study was conducted to analyse clinical effect of preoperative ureteral stenting in the treatment of renal calculi treated with flexible ureteroscope with the details reported as follows. A total of 120 patients with renal calculi enrolled in our hospital from April 2016 to April 2017 were selected as the objects. Among them there were 72 males and 48 females, aged 27-75 with an average age of (43.12 ± 7.82 y) and a disease duration of 1-5 y; all the patients were examined by ultrasonography, CT and abdominal X-ray and the result showed that there was unilateral renal calculi in 87 cases and bilateral renal calculi in 33 cases; the size of renal calculi was 0.8-2.2 cm, (1.42 ± 0.24 cm) on the average; before operation all patients were examined by urinary B-mode ultrasound, CT scan of double kidney and intravenous urography to confirm the situation of hydronephrosis. It was showed that 20 patients had hydronephrosis, 3 patients had renal calyces hydronephrosis and 97 patients had no hydronephrosis. According to examination results of urinary B-mode ultrasound, CT scan of double kidney and intravenous urography, the patients under surface anesthesia were inserted with ureter in treated side by using double J tube and two weeks later they came back to the hospital for treatment of flexible ureteroscopy and laser lithotripsy; they were given preoperative routine urine culture as well as drug sensitivity test and took broad-spectrum antibiotics the day before operation. If the patients were subjected to such symptoms as dysuria, urgency or more than 150 in the number of U-LEU, the antibiotics can be used after their admission; the patient’s lithotomy position was given intravenous anesthesia with laryngeal mask airway and the pre-placed double J tube was pulled out by wolf rigid ureteroscopy, which was moved upward to the place near pelvis; through the path of rigid ureteroscopy, the super-slip lead silk of nickel titanium alloy was imported into pelvis and then with the rigid ureteroscopy withdrawn, dilated sheath of flexible ureteroscope was implanted under the guiding of lead silk in direct motion. 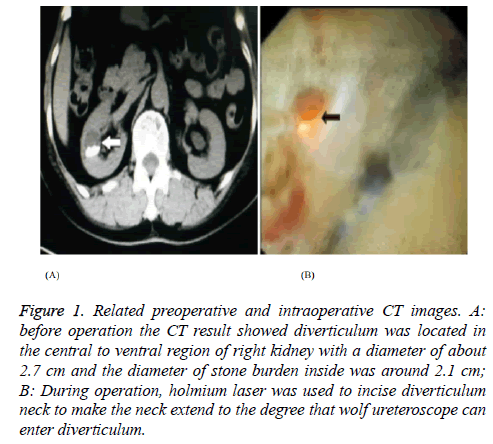 After stone location was determined, the holmium laser with the fiber diameter of 200 μm was embedded through the working channel and energy was adjusted to 30 W. The method of encroachment was used to crush the stone and then F5 double J tube was inserted and remained in urethra canal for 2 d. The patients were treated with broad-spectrum antibiotics for 1-3 d as shown in Figures 1 and 2. Figure 1: Related preoperative and intraoperative CT images. A: before operation the CT result showed diverticulum was located in the central to ventral region of right kidney with a diameter of about 2.7 cm and the diameter of stone burden inside was around 2.1 cm; B: During operation, holmium laser was used to incise diverticulum neck to make the neck extend to the degree that wolf ureteroscope can enter diverticulum. Figure 2: The stone was crushed by being encroached in the surface. The success rate of sheath placement at the first time was recorded and the rate of complications like ureteral mucosa avulsion, injury of ureter or bleeding was analysed; One month after operation, the patients were examined by abdominal Xray and ultrasound to check the stone-free rate and the stonefree result showed no residual stones or the diameter of residual stone was less than 3 mm. The treatment was more effective when the success rate of sheath placement at the first time was higher, the complication rate lower and the stone-free rate higher . All data were processed by SPSS 21 in which the measurement data were expressed by “mean ± standard deviation” (͞x ± s) and the count data were expressed by “n (%)”. All of 120 patients were treated with unilateral flexible ureteroscopy and laser lithotripsy and the sheath placement was successful at the first time in 118 cases with a success rate of 98.33% (118/120) and failed in 2 cases. After the application of F6 double J tube to dilatation for two weeks, the sheaths were all placed successfully and the operation was completed. During pre-dilatation period, there were 21 cases of urination pain and 11 cases of gross hematuria with the rate of urinary irritation symptoms reaching 26.67% (32/120), after the patients’ taking antibiotics and drinking a lot of water, the symptoms disappeared with no serious complications like ureter hemorrhage or perforation; after operation, hematuria was found in 86 patients at the rate of 71.67% (86/120) in which the bleeding in 80 patients ceased without special treatment within 48 h and 5 patients ceased to bleed 4 days after taking hemostatic drugs; chill and pyrexia occurred in 2 patients at the rate of 1.67% (2/120) and it was cured 4 d after treatment of anti-infection and anti-shock; 3 patients had varying degree of abdominal pain in treated side in which 1 patient needed to take analgesics; the incidence of complications which need therapeutic interventions was 3.33% (4/120). The patients came back to the hospital and were examined by abdominal X-ray and ultrasound a month after operation, the result showed the stone has been cured in 112 cases with a stone-free rate of 93.33% (112/120). After the treatment of extracorporeal shock-wave lithotomy, the diameter of residual stone was less than 3 mm in 6 patients and the remaining 2 patients were required to strengthen training with regular reexamination. Renal and ureteral calculi, also known as upper urinary calculi, is seen more commonly in males than in females and shows main symptoms of angina and hematuria, which will be aggravated after physical labor and its common complications include ureteral obstruction and infection [5-9]. Without prompt treatment, it would endanger the kidneys and even make the kidney function gradually lose, which seriously affects the safety and quality of life in sufferers. Once the condition of calculi is identified, the patient should be treated as soon as possible. Ureteroscope lithotripsy is to insert a slender endoscope 3 mm in diameter into ureter through urethra and bladder, then crush and take out renal calculi or ureteral stones. It, by means of human natural urinary tract cavity, causes no incision in the body and is a kind of pure endoscopic minimally invasive surgery in Department of Urology with the advantages of less injury, light pain and quick recovery in patients [10-12]. Double-J tube made ureteral stent with absorbable thermoplastic elastomer as a substitute for non-absorbable stent commonly applied in clinical trials, which avoids the withdrawal in reoperation and effectively alleviates the suffering of patients, suitable for upper urinary tract operations like kidney stone as well as ureteral stone and the treatment for stone break as well as ureteral stricture. The placement of ureter enables to induce urine drainage and prevent ureteral stenosis, obstruction and adhesion [13,14]. Previous studies have suggested that preoperative preset ureteral stent is helpful to remove stones, reduce renal colic, and can effectively protect the kidney function , In any case, it is also reported that the ureteral stent is not only unfavorable for calculus expulsion, but also can cause complications such as hematuria and lower urinary tract irritation. It is not recommended to use ureteral stenting in extracorporeal lithotripsy . The main reason for this difference may be the size of the stone after the operation of flexible ureteroscopy and laser lithotripsy, and the small number of cases may also cause the difference in the results of the study. In this study, we applied double-J stent placement before operation for ureteral predilation in flexible ureteroscope treatment of kidney stones and found that the success rate of sheath placement at the first time was 98.33% and the stonefree rate 1 month after operation was 93.33%, suggesting that the effect of flexible ureteroscopy combined with a double-J sent placement for renal calculus is very significant and the reasons are that: because the double J tube has properties of soft texture, no corrosion, smooth surface, large diameter, thin wall and good flexibility, it enables to make the patients feel comfortable with good dilatation effect and can indwell in the body of patients for longer time, helping to reduce hydronephrosis and prevent repeated ureteral stenosis; meanwhile it is convenient to insert and withdraw a double J tube, which can effectively avoid the incidence of incarcerated calculus and stop large residual stones from entering ureter to make the ureter moderately loose; urine is drained into bladder along the stent by wall attachment effect with urinary tract maintained smooth. When the stent is withdrawn, the stone powders and small particles accumulated in the pipe wall can be removed out at the same time to promote stone discharging; With the double-J stent placement for ureteral predilation, the flexible ureteroscope enables to accurately and effectively identify the sites of stones with sheath, thus enhancing the success rate of sheath placement and finally improve operation effect . Due to the limitations like objective conditions and actual research level, the long-term effect in the two groups of patients needs further verification in future clinical studies. In summary, double-J stent placement before operation for ureteral predilation leads to excellent curative effects. It cannot only effectively increase the success rate of sheath placement at the first time and reduce the complications in patients, but also significantly raise the stone-free rate and relieve the patients’ pain with good effect and of practical application value. Fund Project: Nanjing City medical science and technology development projects. Fund number: YKK16282. Liu G, Cai W, Zhang J, Fang X. Curative effect of double J stent placement with flexible ureteroscope for renal calculi: a report of 8 cases. Chinese J School Doctor 2016; 30: 591-592. Cai W, Jiang X, Wen L. Clinical study of preoperative treatment of renal calculi without indwelling double J tube and one-stage soft ureteroscope. China J Endosc 2016; 22: 58-62. Yang W, Li X, He Y, Feng G, Li T, Xu G, Lai D, Xu W, Xie Q, Zhao H, Yang M. A randomized controlled trial of double J tube before ureteroscopic lithotripsy. Chinese J Endourol 2016; 10: 100-103. Duan K, Liu Q, Wang Y, Zhang W, Duan J. Effect of double J tube pre dilation combined with flexible ureteroscope on subrenal calyx calculus: a report of 115 cases. Med J Nat Defend Forces Southwest China 2015; 25: 389-391. Zhong S, Ouyang T, Liu J, Yuan J, Wang Z, Cheng ZX, Guo L, Li L, Zhang J, Chen L. Treatment of flexible ureteroscopy and laser lithotripsy for upper urinary calculi: a report of 86 cases. Chinese Med J Metallurg Industr 2016; 33: 155-157. Nikolaos F, Marios S. Mini percutaneous nephrolithotomy in the treatment of renal and upper ureteral stones: Lessons learned from a review of the literature. Urol Ann 2015; 7: 141-148. Javanmard B, Razaghi MR, Ansari JA. Flexible ureterorenoscopy versus extracorporeal shock wave lithotripsy for the treatment of renal pelvis stones of 10-20 mm in obese patients. J Laser Med Sci 2015; 6: 162-166. Stasinou T, Bourdoumis A. Endourological urethral dilation using a ureteral access sheath. Ann Royal Coll Surg Engl 2015; 97: 319-320. Ordon M, Andonian S, Blew B. CUA guideline: management of ureteral calculi. Canadian Urol Assoc J 2015; 9: 837. Cox AC, Thomas JA. Insertion of thermoexpandable metallic ureteric stents can be aided by ureteric predilation. Ann Royal Coll Surg Engl 2016; 98: 158-159. Kuntz NJ, Neisius A, Tsivian M. Balloon dilation of the ureter: a contemporary review of outcomes and complications. J Urol 2015; 194: 413-417. Alkan E, Turan M, Ozkanli O. Combined ureterorenoscopy for ureteral and renal calculi is not associated with adverse outcomes. Central Eur J Urol 2015; 68: 187-192. Guo J, Yang WZ, Zhang Y. Ultramini nephrostomy tract combined with flexible ureterorenoscopy for the treatment of multiple renal calculi in paediatric patients.. Korean J Urol 2015; 56: 519-524. Mitchell CR, Kuebker JM, Mccormick B. Lubriglide® sequential ureteral dilators: a safe and effective method of ureteral dilation. J Endourol 2017; 31: 573-576. Chandhoke PS, Barqawi AZ, Wernecke C, Chee-Awai RA. A randomized outcomes trial of ureteral stents for extracorporeal shock wave lithotripsy of solitary kidney or proximal ureteral stones. J Urol 2002; 167: 1981-1983. Ghoneim IA, El-Ghoneimy MN, El-Naggar AE, Hammoud KM, El-Gammal MY. Extracorporeal shock wave lithotripsy in impacted upper ureteral stones: a prospective randomized comparison between stented and non-stented techniques. Urology 2010; 75: 45-50. Treacy PJ, Rastinehad AR, Phalecque LIDL. Endoureteral management of renal graft ureteral stenosis by the use of long-term metal stent: an appealing treatment option. J Endourol Case Rep 2016; 2: 155-158.